In the format of all against all, in the Men’s Category, Argentina and Brazil arrived undefeated to the last day. Their final confrontation would crown the Champion. The albiceleste team won with solvency in the direct match proclaiming Champions of the South American 2017. The night before, Chile and Paraguay starred in a confrontation to see who occupied the third step of the podium. After the first point achieved by the paraguayans and the second by the chileans, everything would be decided in a third match, where the host team knew how to suffer to take a historic win and break a 12 year streak against the guaranies. 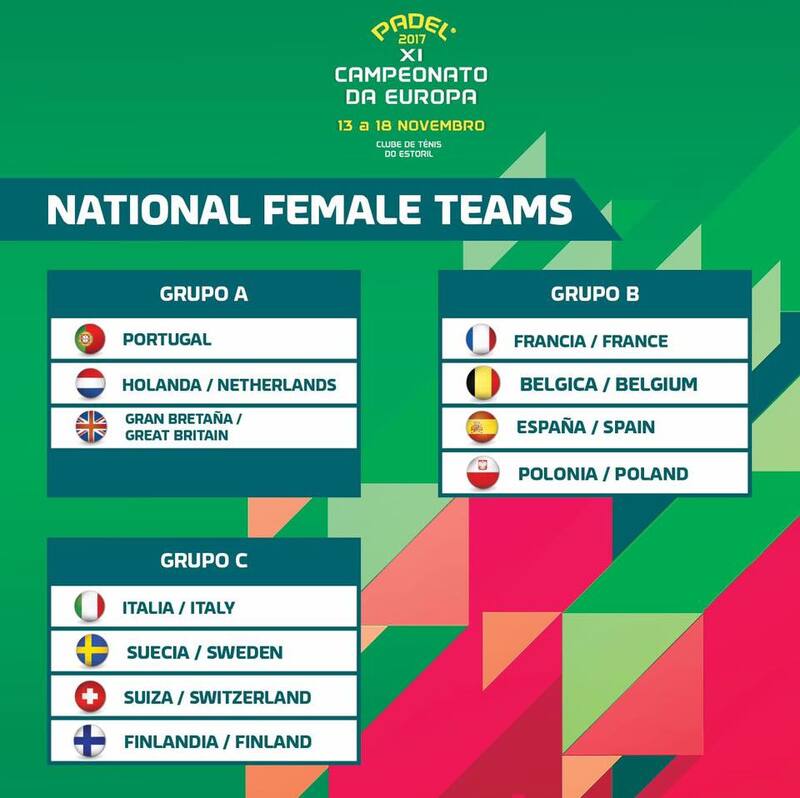 In Women’s Category, after the dispute of all the days, the selections of Argentina and Brazil would fight for the definition of the 1st and 2nd place, while Chile and Uruguay would do it for the 3rd and 4th place. In the duel for the title, the argentine team was imposed against the brazilians rising with the prized continental tittle. In the definition for the third place, Uruguay and Chile starred in a series that needed to go to the third match to consecrate a huge success for the uruguayan team, proclaiming third of this South American 2017. The activity in South America doesn´t stop, this weekend it moves to Brazil. Organized by Cobrapa ( Brazilian Padel Confederation ), the South American Amateur Padel Championships is held at the facilities of Padel Pro, Bento Gonçalves. In the next year Paraguay will host the World Padel Championships 2018. Given the important magnitude of the FIP event, the President of the International Padel Federation Mr. Daniel Patti traveled to Asunción to meet with local authorities and verify the projects that are being developed in the preparation of the World Padel Championships 2018. At the meeting with the Minister of Sports of Paraguay Mr. Victor Manuel Pecci, the General Director of the National Secretariat of Sports Mr. Bruno Zanotti and the President of the Paraguayan Federation of Padel Mr. Rubén Duarte, the President of the FIP Mr. Daniel Patti was able to verify that everything proceeds according to the planned plans and next to the Paraguayan authorities the secondary offices were visited, dates and details were defined and the seat of the Paraguayan Olympic Committee was visited with the corresponding reception by Ms. Larissa Shaerer, General Secretary of the Paraguayan Olympic Committee. 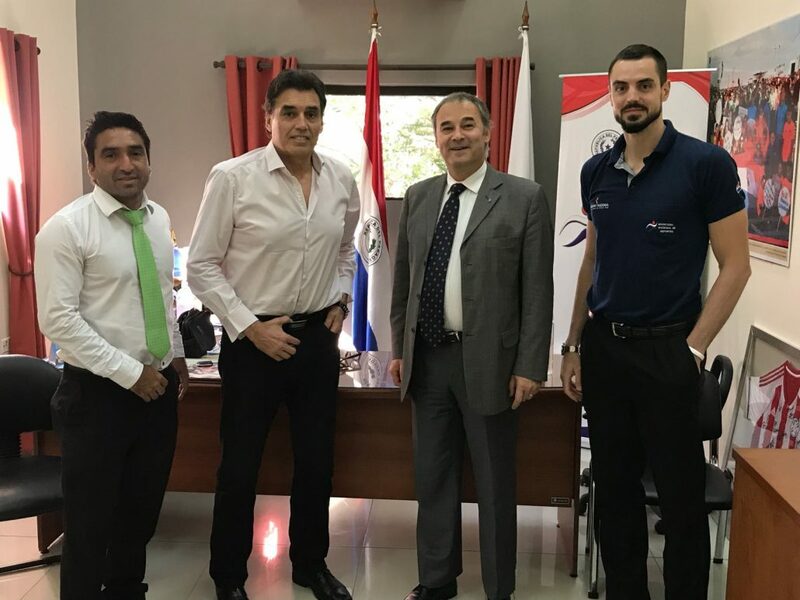 This visit, apart from knowing and inspecting details for the next World Padel Championships 2018, also serves to support and consolidate the Padel Paraguayan Federation in response to requests from Paraguayan government and sports authorities. Proud to announce this next step for NPB ( Nederlandse Padelbond / Dutch Padel Federation), La Playa, Padel Academy and PadelShop. From December 1 to 3 at La Playa Rijswijk and for the first time a FIP500 Tournament for men and women will be organised in The Netherlands. More prize money, better players and more fun. And big upgrade for the women Tournament ( last year it was FIP100 ). Welcome FIP500 Padelshop.com! Complete info about this FIP500 Padelshop.com Tournament in Setteo. The president of the International Padel Federation, Mr. Daniel Patti, wanted to take stock of the European Championships 2017 held in Cascais after an intense week of competition. In words to European Padel Championships, official media responsible for covering the event, Mr. Daniel Patti highlighted the excellent level that has been seen during the days of the Championship and noted the enormous evolution that has been getting the European padel since 1995 the 1st European Padel Championship will be played with 3 participating teams. Attending the Portuguese media Padel Wall, Mr. Patti expressed the enormous satisfaction of the FIP, both for the success of the Championship and the level offered by each of the participating national teams.  In that interview he pointed out the constant growth that padel is experiencing on an international scale and pointed out that work is being done so that in the future the padel can be part of the olympic family at an institutional level and be an exhibition discipline at the Olympic Games of Tokyo 2020 , Paris 2024 or Los Angeles 2028.
http://www.padelfip.com/wp-content/uploads/2017/08/patti-fuera.jpg 485 750 padelfip_admin http://www.padelfip.com/wp-content/uploads/2017/11/FIP1.jpg padelfip_admin2017-11-24 20:10:492018-08-11 16:06:54Daniel Patti: "Excellent Championships"
The most important Championship in Europe finished last Saturday after intense days of competition. A splendid week in which all European national teams have fought to achieve their different goals in the excellent padel facilities in Estoril and have been able to enjoy the warm welcome of the Portuguese town of Cascais. 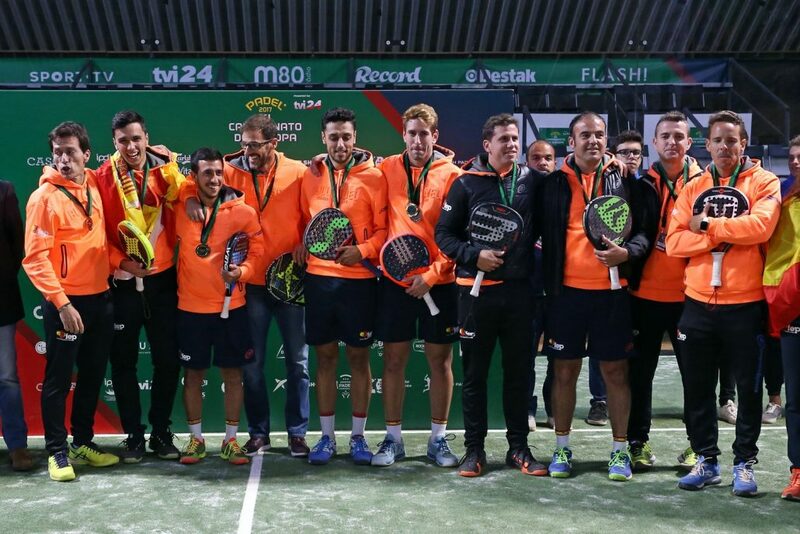 An excellent demonstration of the great organizational capacity of all participating federations and the host FPP ( Federação Portuguesa de Padel ), who together with the FIP and Smash Padel have organized the Championship. A total of 15 National Teams ( 15 in Men’s Category and 11 in Women’s ) have elucidated great confrontations in search of victory. The international representation has been completed in 16 countries, thanks to the participation of a Norwegian pair in the European Championships by National Pairs. Far is that first European Championships played in Italy in 1995 with the participation of only three countries: Spain, France and Italy. 22 years later, this European Championships 2017 confirms the excellent progression that padel is achieving on the European continent. Spain was proclaimed European Champion by National Teams in Male Category, winning the Final in the host team, Portugal. In the fight for the third and fourth place, Italy was imposed on France, reaching the great success of obtaining a place on the podium for the transalpine country. Check here all the results of the European Championships 2017 by National Male Teams. In Female Category, the Spanish team won against Portugal in the Grand Final. As in the Male Category, Italy and France, the faces were seen in a more than vibrant clash, and this time the French took the victory to reach the third step of the final podium. Check here all the results of the European Championships 2017 by National Female Teams. In the European Championships for National Pairs, in Men’s Category, the Spanish pair formed by Aday Santana and Alvaro Cepero were proclaimed Champions when defeating in the Final the couple Willy Lahoz / Alex Ruiz. Check here the Complete Table of results. In Women’s Category, the Spanish pair Marta Ortega / Ariana Sanchez beat the Portuguese pair Ana Catarina Nogueira / Filipa Mendonça proclaiming European Champions by National Pairs. Check here the Complete Table of results. From November 22 to 26, the best padel in South America will meet in San Antonio, Valparaiso Region, Chile. The National Teams of Argentina, Brazil, Paraguay, Uruguay, and the host country, Chile, will compete at Padel San Antonio, the host club of the 2017 South American Padel Championships. 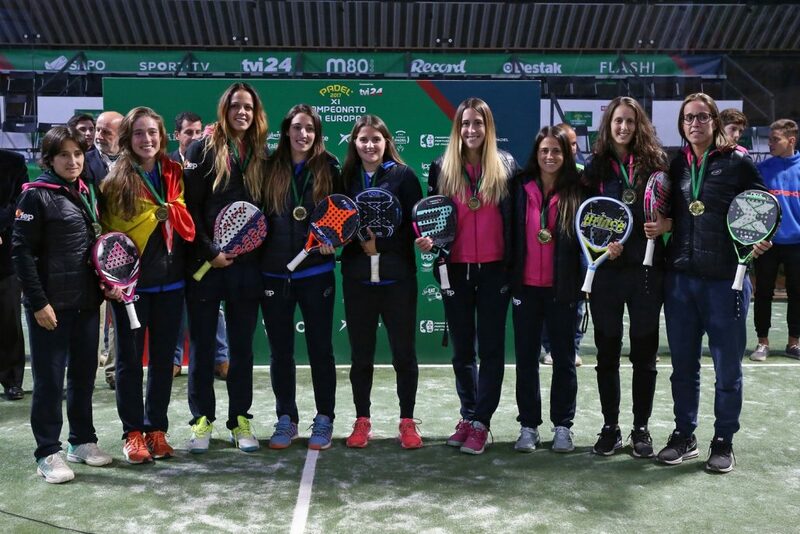 Organized by the Padel Federation of Chile ( FEPACHI ), the 5 National Teams will participate in men’s and women’s competitions in double days that will be held over 3 days, while on Sunday the activity will take place from the morning until the midday. This 2017 South American Championships takes over from the one played in 2015 in the Brazilian city of Bento Gonçalves. In it, Brazil won the title in Men’s Category, Argentina was second, Paraguay third, Chile fourth and Uruguay fifth. In Women’s Category, Argentina was proclaimed champion, Brazil was second, Uruguay third, Paraguay fourth and Chile was in fifth position. From different provinces throughout the country, more than 20,000 fans vibrated in a fantastic week at La Rural, confirming again the enormous passion with the padel sport feels in Argentina. An exceptional environment that was lived throughout the week in Buenos Aires making an event of a very important magnitude. The APA has supported with its presence and has contributed in the organizational management. 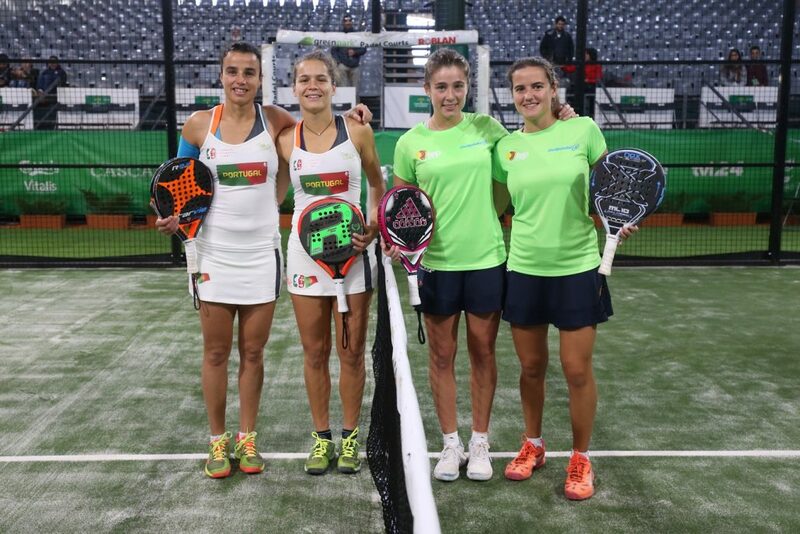 Argentina is living history of the padel. In the decade of the 80 our sport invaded with force the main cities of the country like Capital Federal, Mar del Plata, Mendoza, Cordoba and Rosario, among others. In 1982 there were no more than 12 courts in the whole country. Thanks to the boom experienced in the following years was in 1987 when the APA ( Argentinean Padel Association ) was founded, currently chaired by Mr. Oscar Nicastro, and began to make official the first national tournaments and the subsequent dispute of the first international meetings Spanish-Argentina. In 1991, padel was considered the second most practiced sport in Argentina, after soccer, obtaining an important coverage in the main national media. Since then and until our days, the Argentinean padel, together with the Spanish one, has had an essential and fundamental role in the development of our sport. 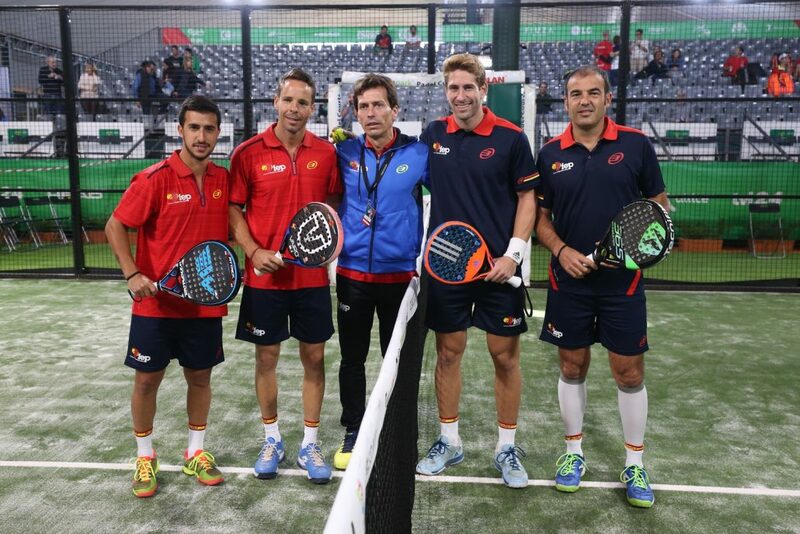 The grand opening ceremony of the XI European Padel Championships was held yesterday evening. The event took place at the Tennis Club do Estoril, official venue club of this European 2017, with the representation of all the National Teams that will dispute the Championship with all of their respective players in the traditional protocol parade. All National Teams were presented on stage with the flags of their respective countries in the interior of the central court and waiting for the official parliaments in charge of the authorities present at the opening ceremony: Mr. João Paulo Rebelo, Secretary of State of Youth and Sport / Mr. Miguel Pinto Luz, Vice-president of the Municipal Chamber of Cascais / Mr. Daniel Patti, President of the International Padel Federation / Mr. Ricardo Oliveira, President of the Portuguese Padel Federation and Mr. Antonio Simões de Almeida, President of Estoril Tennis Club. All of them highlighted the importance for the country of Portugal, and specifically for the town of Cascais, to host this 2017 European Padel Championships and warmly welcomed all delegations. 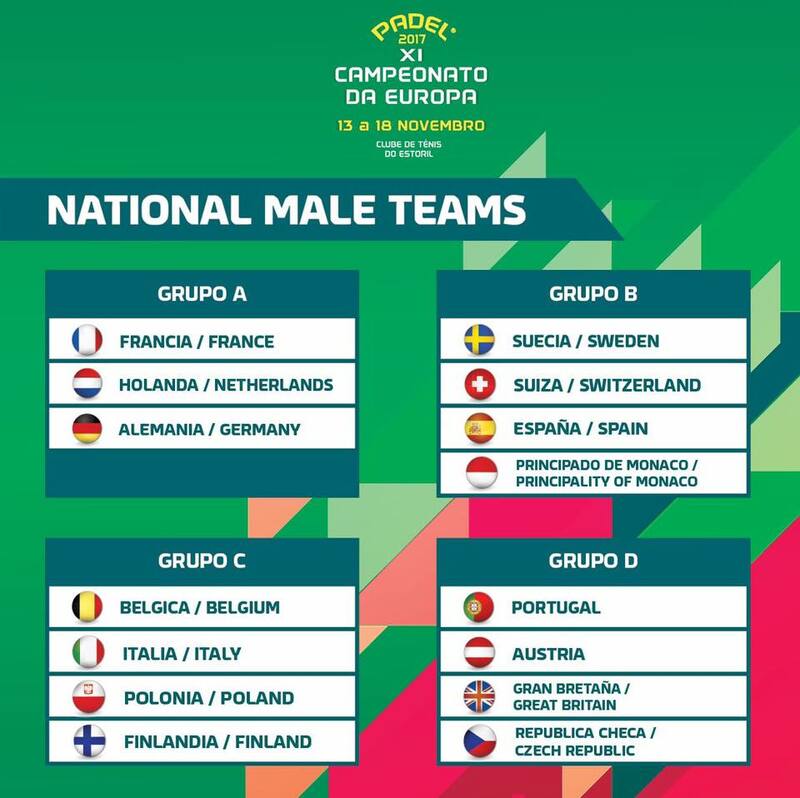 15 National Men’s Teams and 11 National Women’s Teams will compete until November 18 in the European Championships for National Teams: Austria, Belgium, Finland, France, Great Britain, Germany, Italy, Poland, Portugal, Spain, Principality of Monaco, Czech Republic, Sweden and Switzerland. At the same time, the European Open Championship will be held in pairs. Starts the great European padel party! The Municipal Chamber of Cascais hosted this Friday the Official Presentation and the Group Stage Draws of the XI European Championship by National Teams. This presentation and draws of the Championship was attended by Mr. Ricardo Oliveira, President of the Portuguese Padel Federation / Mr. Daniel Patti, President of the International Padel Federation / Mr. Antonio Simões de Almeida, President of the Club of Tennis Estoril / Mr. Nuno Costa, President of Smash Padel / Mr. Augusto Baganha, Director of the Portuguese Institute of Sport and Youth and Mr. Carlos Carreiras, President of the Municipal Chamber of Cascais. All the authorities pointed out the great expectation that the portuguese city of Cascais will host the European Championship of one of the sport modalities that is growing most in Portugal thanks to the great work of the FPP ( Federação Portuguesa de Padel ) has been doing for years. Some of the players of the host team were responsible for exercising “innocent hands” in the realization of the draw. From this Monday November 13 starts the Competition by National Pairs. On Monday at 8 pm will be the Grand Opening Ceremony at Tennis Club do Estoril with the presence of all National Teams represented in this European 2017. It will be on Tuesday November 14 when starts the European Competition at the level of National Selections.